by Ben Coleman.In Family.Leave a Comment on ARE YOU ON THE SAME PAGE IN YOUR MARRIAGE? Thankfully we have an example of what that looks like for our marriages. Jesus knows our every flaw but it does not limit or pause His love for us. Instead, He made the ultimate personal sacrifice, forgave us and pursues intimacy with us daily. There is one more key practice we can learn from Jesus…having shared priorities. And when we have this in a marriage, it actually makes it easier to forgive and sacrifice for each other too. I love this quote from Max Lucado. In his book, In The Eye Of The Storm, he shares the story of a family fishing trip gone bad. A terrible storm blew through and made it impossible to fish. So they spent their weekend in a cold camping trailer playing card games and telling stories. It didn’t take long for them to lose interest in the games and notice how annoying each other can be. So they packed up and headed home early. 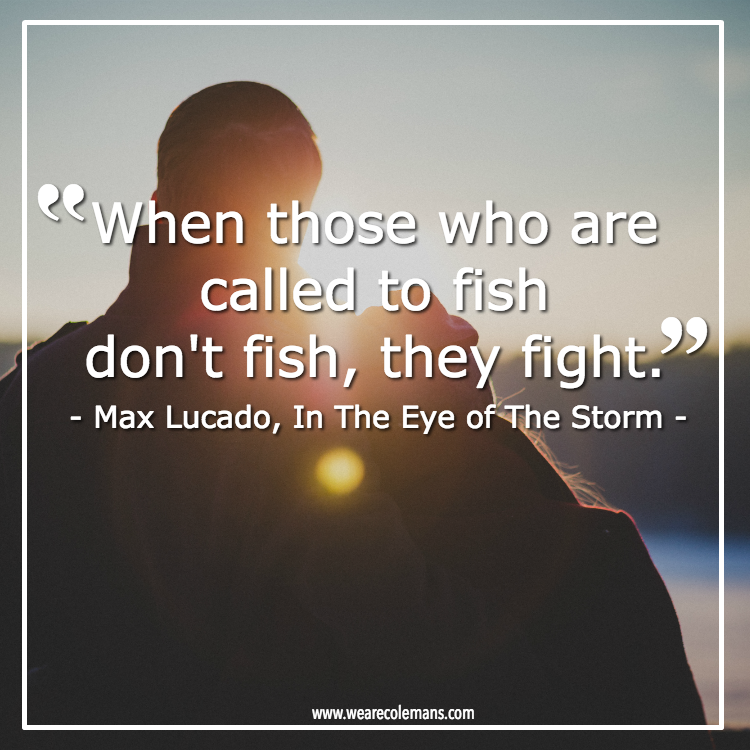 What Max Lucado learned was that when your goal is to fish and you end up playing games instead…you end fighting over silly things. The same is true in marriage. If you are not on the same page about your mission and purpose in life, then a marriage can quickly feel like two people filling the same space and just playing games. Nothing important is getting accomplished, and you end up fighting over silly things. The reality is you have limited time and limited resources. If there are competing priorities in your marriage, then there is competition for time and resources. You might fully know each other, but you can’t fully love each other if you have competing priorities in life. You have to be on the same page. Again, if we look to the Christ/Church model, we see that The Church adopted the priorities of Christ. The Bible tells us that through marriage, God takes a husband and wife and combines them into one new flesh. I always struggled with how to explain this concept, until the day Megan took a painting class. She came home one night with a color wheel painted on a small canvas and explained how they mixed their own colors. Each painting from that point forward was a custom creation, not just because of the painter, but because of the uniqueness of the paint too. Your marriage is like a one-color custom painting. God is the painter, combining the two colors represented by your different personalities and talents into one custom color. He is using this new color to paint something in this world that only He can imagine. But if one color doesn’t want to share space on the canvas, then the painting gets smeared. Or if one color believes that their priorities are more important, the new color God wants the world to see won’t shine through. Intimacy requires us to surrender to God’s plan and discover the new priorities He wants us to share together. We have a common goal to chase after and celebrate together. We know that we are “painting better together” when we are practicing all three of these intimacy keys. If either daily forgiveness and/or personal sacrifice are difficult for you and your spouse, take some time to pray through what priorities and goals God could be calling you to do together in your marriage. There’s nothing better than a common goal to make two people begin working like a team again. I pray that you love seeing what God uses your marriage to paint in this world! QUESTION: What has made the biggest impact in your marriage…forgiveness, personal sacrifice or having shared priorities? Next Next post: DOES YOUR CHILD NEED A SHELTER, SHIELD OR SWORD?